Ark was first formed in South Korea - it’s really encouraging to know that petrol-headism is a global condition, and it doesn’t matter if you’re a kid in a garage in Derby or you’re watching F1 at the Korean International Circuit, we all can’t get enough of going fast. What we’ve got for you is a brilliant range of premium exhaust and suspension systems - Ark are known for kit that looks slick and runs slicker. You’re making a statement when you get parts from these guys and you’ll be joining a global family - their parts can be found in North America, Europe, the Middle East and parts of Asia. TIG welded and CNC machined, their stuff is not going to fall apart any time soon. Choose between polished chrome sheen or burnt tips to really inject some personality into the look of your exhaust systems. Chrome gives your car’s dirtiest part a sheen to match the rest of it and burnt tips show off your gear-head recklessness. Of course, looks are nice, but what exhausts are primarily about is the noise. Ark know this and they offer a huge variety of mufflers to give your car a signature sound - they list the sound each exhaust system makes in decibels, to really help you make your decision. Their Helmholtz tech reduces in-cabin drone, so you’ll only hear your exhaust when you want to. Here at Tarmac Sportz, we’re committed to pooling products and innovation from all over the world and Ark Performance are one of the best manufacturers we deal with. In their own words: “Since the beginning, our main goal is to design and engineer high quality products that are reliable and proven for all types of professional motorsports and street driving.” They sound alright to us. At Tarmac Sportz, we know what your car means to you, and that you want it to look and sound unique to you, that’s why we give you so much variety in brands and why we choose brands which also share our beliefs. They source the best materials to make their products out of. Each system is handcrafted from T304 stainless steel and boasts thicker-than-competition sidewalls, which significantly increases the construction quality whilst adding only a small amount of extra weight. They use the mandrel bend process for superior durability and their signature x-pipe is developed in-house to provide the best flow for your exhaust. They’ve got first-hand track experience, from their Team ARK Racing division, so their suspension will work just as well for them as it does for you, on the track or streets. 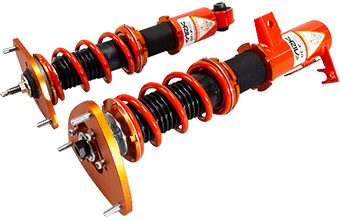 Mono tube shocks offer responsive handling and a smooth ride, and all of their suspension systems are fully adjustable - height options and 16 levels of customisation let you choose what your ride is like. Ark makes products for Toyota, Infiniti, Hyundai, Mazda, Nissan, Chevrolet and Mitsubishi, to name a few. So, you’ll be covered no matter what make your or model your car is.